Since 15 years I'm collecting the plates, that indicate vehicles on which line are operating (see this pic). Are in Romania any vehicle's plates collectors like me? But your labels looks in poor condition - they are printed on some material included wood and paper. Here it's called 'talashit'. Long time ago (until the 80s) we've got those kind of labels too. After that every label is printed on plastic/PVC or on a thick plastic folio. Since 1998 we begin to replace most of them with digital (exclusivle by the buses and insignificantly by the trams and trolleybuses). Ð•ven though today at least 40% of the vehicles are still using the plastic ones. So - directly to the main question - is anybody interested in exchange of romanian label to bulgarian one ? 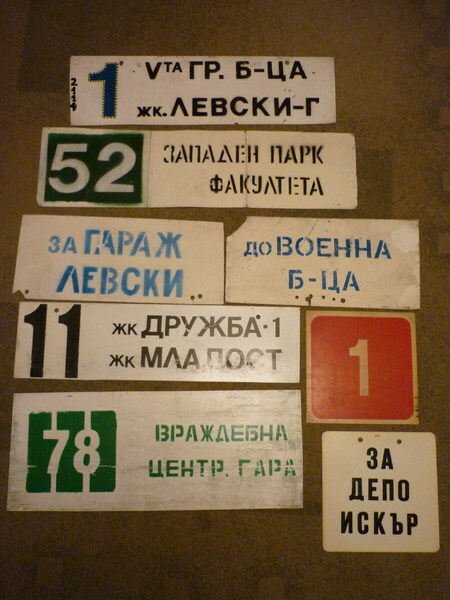 Almost all Romanian plates were printed on this matherial (the same matherial is still used to cover the inside of the walls and roof of the vehicles). The plates used on the former Ikarus 260 buses in Bucharest were made by metal, but they were old (and the routes were changed), so the last buses had paper sheets (printed or even hand written!) instead of plates. Other cities (for example Timisoara, Oradea, Targoviste) use only printed paper sheets at the vehicles without a digital display. I'm really sad to read that no original Ikarus' plate is in use. In Sofia the last 3-4 were still in use until 2008 when I'd decided to took them for my collection. In the other cities, that are still operating Ikarus (Varna, Sliven, Pernik, Vratsa) is easy to find those original plattes, but they are repainted and often are advertising the transport company.